I don't normally like to blog out of order but with an event of this magnitude how could I not? So without further delay we present tonight's main event, the first annual (and last) Panda Sauce Eats Pasta Challenge. The Rules: Whoever eats the most bowls of pasta wins. In the event of a tie, whoever eats more of the final bowl wins. 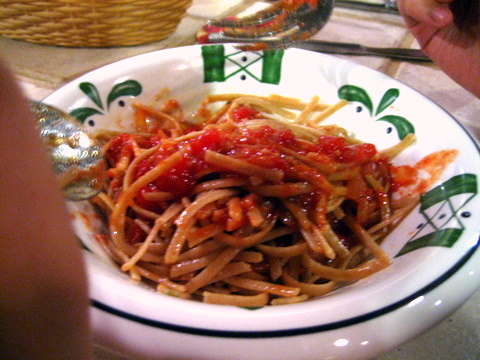 Ordering rotates between the three competitors, but no pasta/sauce combination can be repeated. 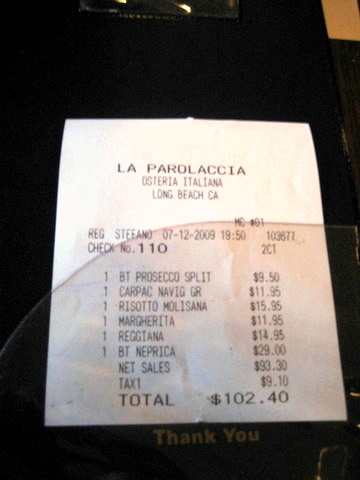 Competitors can take up to 20 minutes between orders of pasta. Falling two bowls behind the other competitors results in a loss. Failure to keep all the food down also results in a loss. 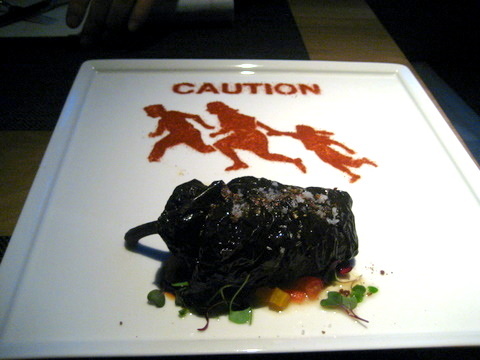 Competitors may add whatever seasonings they wish to the dish, but other diners are not obligated to follow suit. 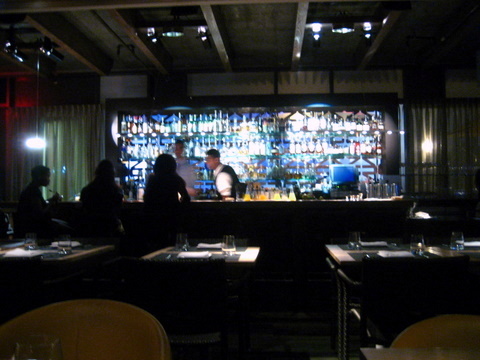 Diners are free to eat or drink other food but it does not count towards the challenge. 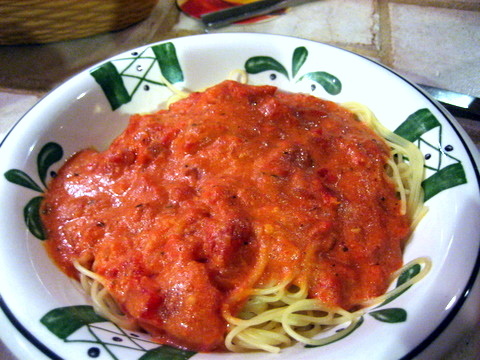 First person to lose pays for the entire meal at Olive Garden. 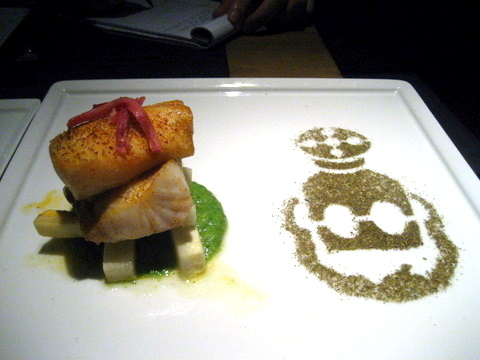 The Prize: 25-course custom chef's table menu at Providence. For those who don't know the back story behind the bet, Danny posted his excitement at the return of Olive Garden's never ending pasta bowl. This led to much good-natured ribbing by Christine which in turn led to the original contest between them with the loser paying for both dinners. Kevin was a late addition to the competition and after much liquor-fueled bravado and trash talking the stakes were raised to a private dinner at Providence with the meal paid for by the losers. 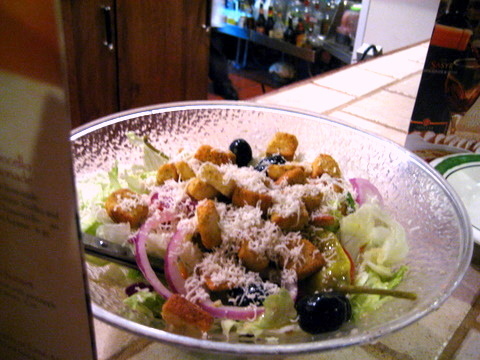 Conventional wisdom would dictate never fill up on bread and salad. Indeed the boys followed this logic nibbling sparingly from plates of salad. Christine however defied common sense, starting with a full helping of salad and going through another bowl over the course of the meal. 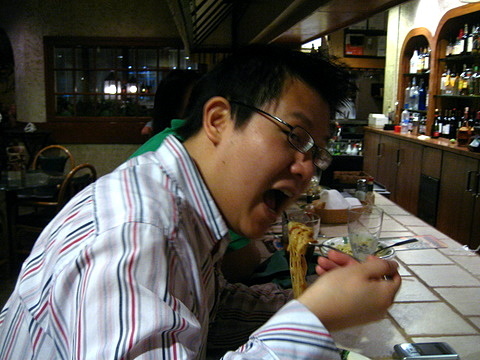 I was so caught up in the competitive spirit, I forgot about taking the picture and just started eating. Surprisingly the whole group seemed to enjoy this pasta, the noodles were well cooked if a bit soft and the richness of the sauce was well balanced by the addition of spinach. The entire group polished this one off with ease and were eager to continue on with the challenge. A fairly safe selection by Danny, the penne is nothing to write home about, but the tangy meat sauce is a nice if pedestrian preparation. Not too difficult, and the boasts are beginning to fly in earnest. 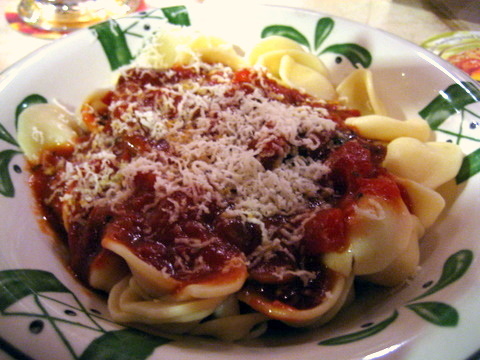 Orecchiette or ear pasta is a round domed pasta shaped vaguely like a small ear (looked more like a hat to me but what do I know.) 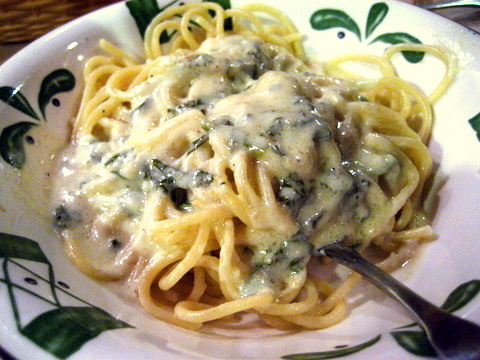 The pasta came out stuck together in clumps and tasted floury or undercooked at times. The paired sauce also sounded much better than it tasted. 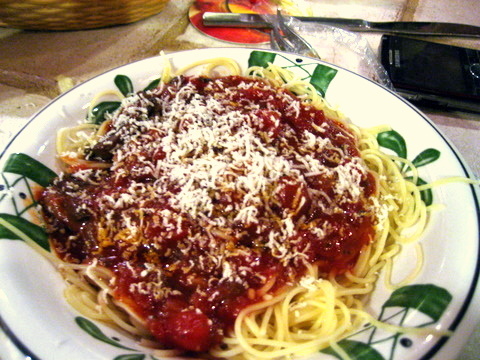 The doughy pasta and salty canned mushrooms made this painful to eat. In contrast to the last round all 3 competitors looked much less eager to continue with the tough fight ahead. 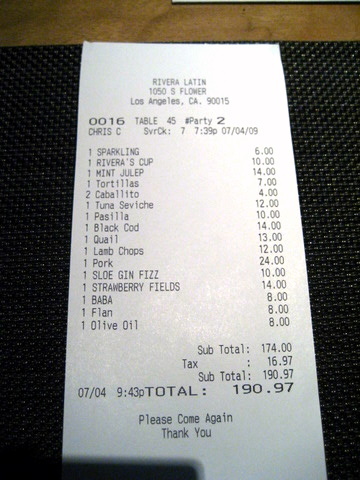 Another classic, most nutrition guides tell you to avoid this one at all costs when dining out and they are right on the money. 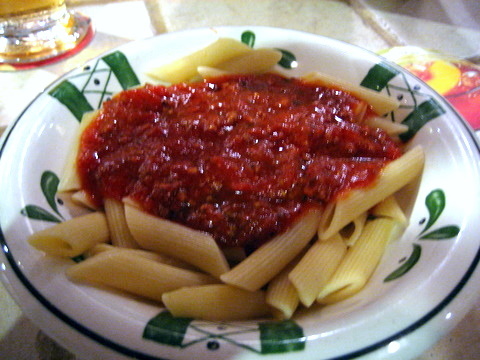 The pasta was decent and when combined with the sauce almost had a sweet butteriness. With no money at stake and no price to drive me on, I stopped midway through this bowl. Probably one of the better tasting selections but with over 1000 calories, not an easy one to get down. All three diners ate this one noticeably slower, taking breaks in between bites. Along with Round 3 this is up for worst dish of the night. 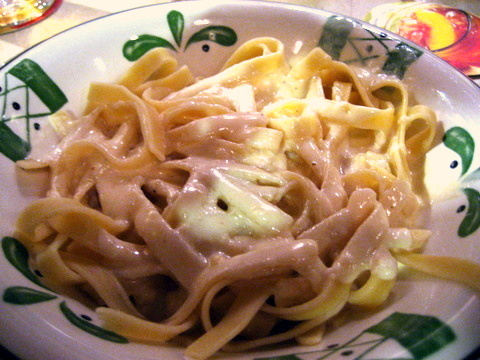 The "noodles" came out in a large starchy mass while the sauce looked terrible and tasted worse. By this point, Danny was clearly falling behind; finishing right as the next bowl came. At the same time Christine established herself as the leader, finishing her pasta well before the other two. I expected the whole wheat linguine to be hideous and Christine's facial expression when she had her first bite confirmed it. Not having experienced it, I can only go by her tweet stating this course tasted like mush. Before even starting this course, Danny was sweating up a storm and appeared to be in serious distress, again only finishing as the next plate came to the table. Having ordered all the available sauce choices, Christine chose to redo the first sauce, a lighter cream sauce with spinach. Probably the best tasting choice, Christine managed to finish hers in a few minutes. Kevin took about 15 minutes to get this one down, but finally managed to do so. After eating two bowls without a break, Danny took the entire 20 minutes before he had to order resting and finally called it quits after having one bite. 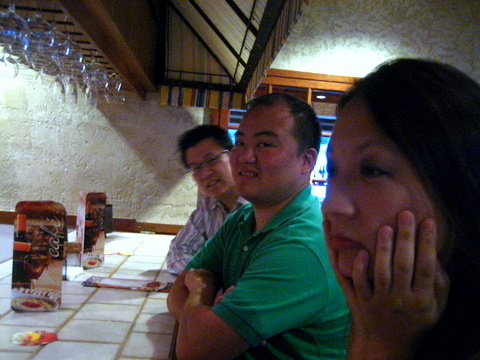 Having thrown in the towel during the previous round, Danny took a perverse delight in ordering the worst pairing available for Kevin and Christine. Again the angel hair came out as a sticky mass, but this time the funk of mushroom assailed the two remaining competitors as they struggled to get the food down. Again Christine powered through hers, finishing in under 10 minutes. Kevin continued to struggle for the full 20 before giving up, leaving us with Christine as the winner. Our third place finisher was Danny with six bowls. Interesting to note, of the people following this event on twitter, none expected Danny to emerge triumphant. See the relieved smile and flushed glow as Danny calls it quits. Apparently Danny passed out for 90 minutes after heading to his car to rest. The competition ended at 9 but he didn't leave till almost 11. 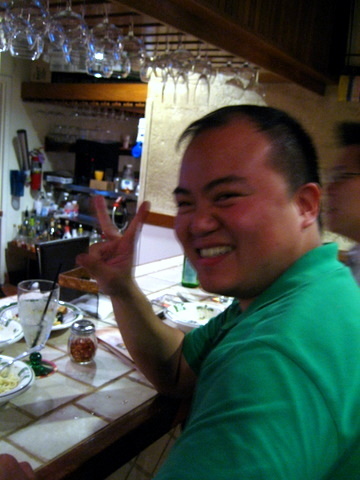 Congratulations to Christine "the Machine" Choi, winner of the Panda Sauce Eats competition. Finishing all 8 bowls while munching on salad the entire time makes the feat all the more impressive. Note the satisfied ladylike smile as she finishes her eighth and final bowl. Enjoy your dinner at Providence, you earned it! I would have put the nutritional info for all three diners but it was made very clear to me that would result in swift and brutal retaliation. 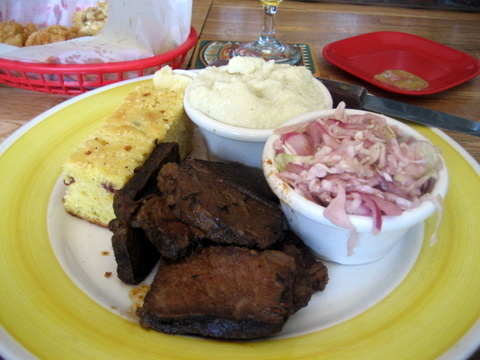 There is something about barbecue that seems so quintessentially American. Grilling meats drenched in sauce over an open flame seems to be indelibly linked to summer. So it was I found myself craving some BBQ before spending a day at the beach. 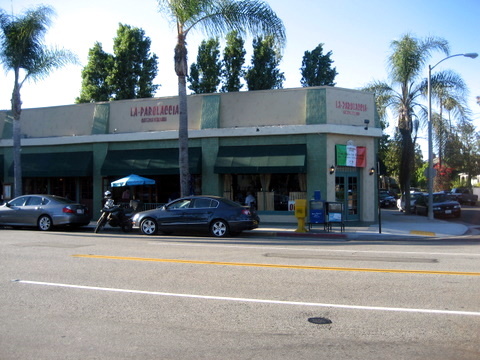 Located on Main Street in Seal Beach, Beechwood is a 2 minute walk from the sand. Maybe even more noteworthy than the food is the ever changing wall of exquisite beers. Given the lofty name, I felt compelled to try this and they didn't disappoint. 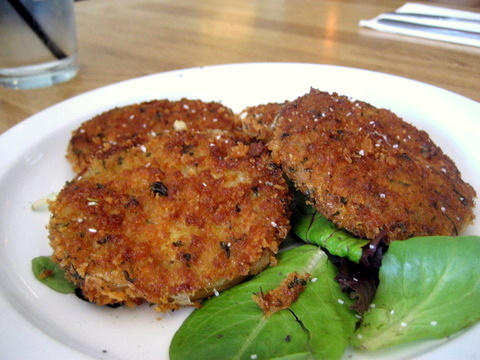 Full of flavor, these tangy savory morsels are the perfect accompaniment to an ice cold beer. I would have preferred a crisper texture, though I suspect the softness is the result of being cooked in hot oil and there isn't much to be done about that. 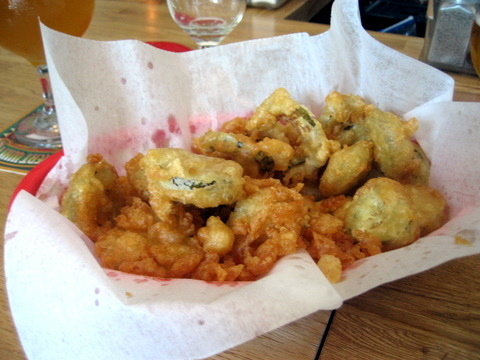 Following the pickles came more fried vegetables. The tomatoes are breaded and fried giving them a crisp exterior, though in contrast to the pickles, these were too firm for my liking. Now we come to the heart of the meal, at Beechwood, the meats are seasoned with a dry rub and supposedly good enough to eat sans sauce, though the restaurant offers bottles of sauce on the side for those who want it. I am partial to beef ribs myself but I found these to be too lean and dry. Normally I like my meat to stand on it's own, but I actually found myself using the sauce to add a bit more flavor and moisture. I have to say I was a bit disappointed by the food at Beechwood though the beer selection is easily one of the most interesting in Orange County. Given this restaurant is 10 minutes from my house and 5 minutes from work, I know I'll be back here to toss off a few beers hopefully I'll be able to resist the urge to come here during work. 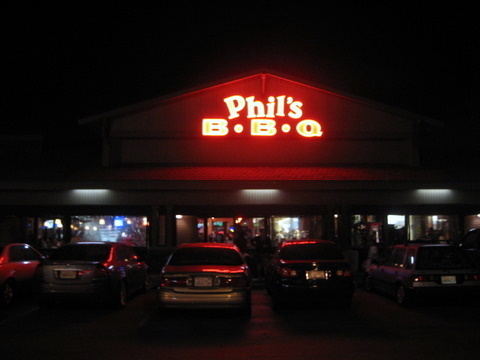 After the lackluster experience at Beechwood, a friend recommended that I try Phil's BBQ in San Diego. 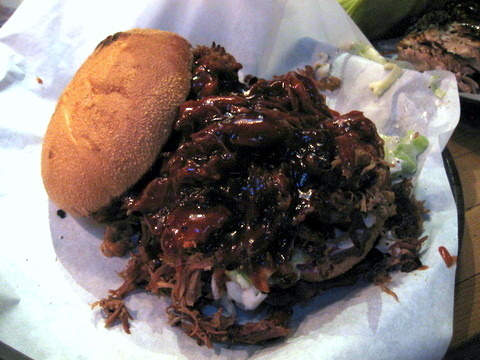 Widely considered the best BBQ in San Diego, when I arrived there was a line going around the side of the building. 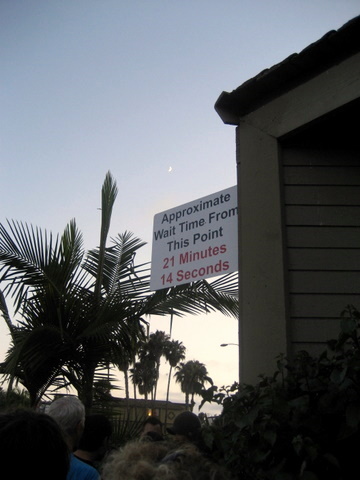 Above the bend was a sign that read "Approximate wait time from this point 21 minutes 14 seconds" an oddly precise version of those accursed signs one sees while standing in amusement park lines. 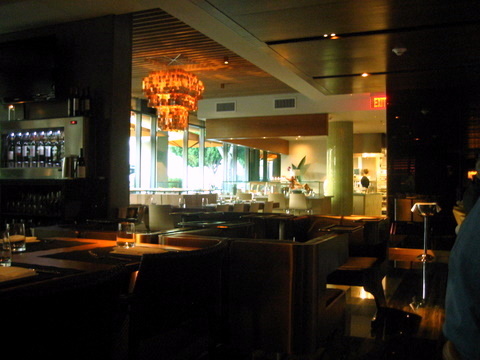 The crowd was once a great endorsement for the restaurant and a painful test of patience. 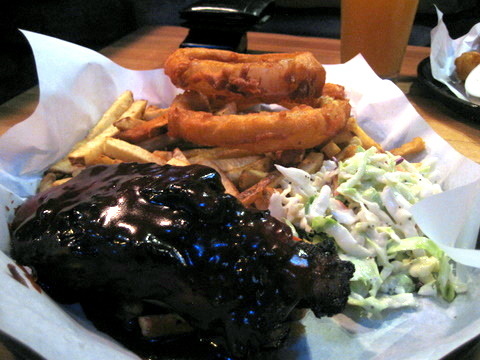 The Beef Rib Tickler had a single beef rib and sides of onion rings and cole slaw. The beef rib was everything I was hoping for, heavy layers of fat mixed into the moist tender lean meat. 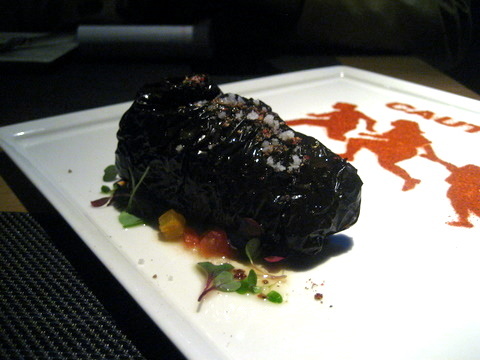 There is a pretty heavy layer of sauce but the richness of the beef still came through. As a kid there would always be baby back ribs at our family barbecues so this is the particular meat I most associate with barbecue. I'm not normally wild about baby backs but, Phil's were nicely cooked, tender and juicy, and a quick flick of the wrist was all it took to separate the meat from the bone. 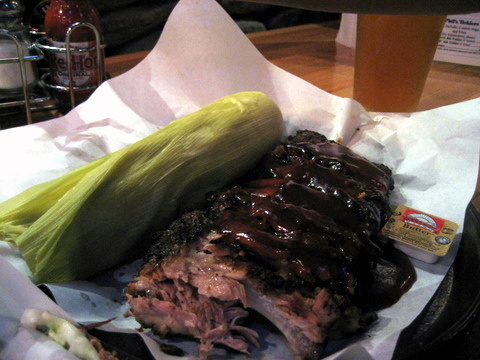 Unlike the beef, the sauce was far more prominent on these ribs. 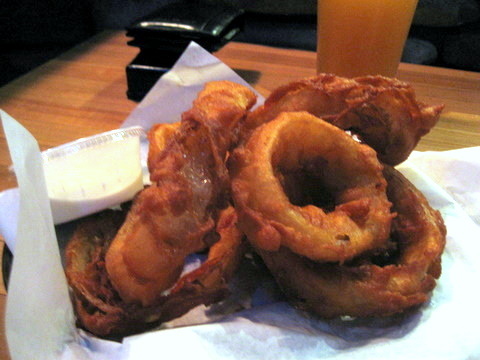 The onion rings definitely lived up to their moniker, the fresh batter was thick and crunchy yielding a soft sweet oniony interior. Delicious alone or dipped in ranch. From the food, I can certainly see why there is a line around the side of the building. 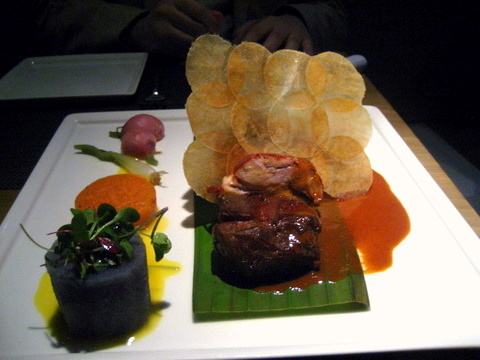 The meat is tender and flavorful and the sauce is well balanced particularly with the beef ribs. Sadly the beer is lackluster compared with the varied and obscure offerings at Beechwood. Combine the strengths of each and I could easily see the line outside the restaurant doubling. 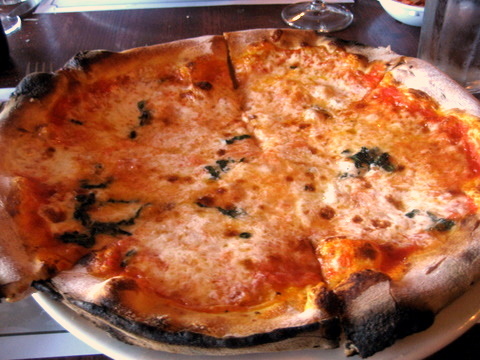 I came to La Parolaccia based on the recommendation from a reader who mentioned they served Neapolitan style pizza with a well done crispy crust. The restaurant touts its pizzas are fired in an oven imported from Italy so I was expecting a down to earth homey restaurant run by people passionate about their food. 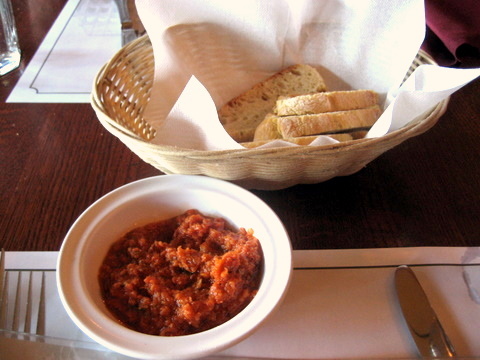 The bread, fairly lackluster in and of itself, came with a sweet tomato paste that served to excite the palate nicely. 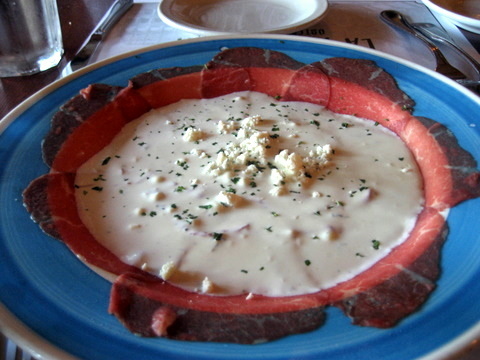 The beef was indeed thinly sliced and came topped with a rich creamy sauce but it desperately lacked salt. This was so painfully bland it was hard to enjoy the tenderness of the beef. There was an option to have this served with arugula and lemon which would have gone a long way to adding some flavor and textural contrasts while moderating the heaviness of the cheese. 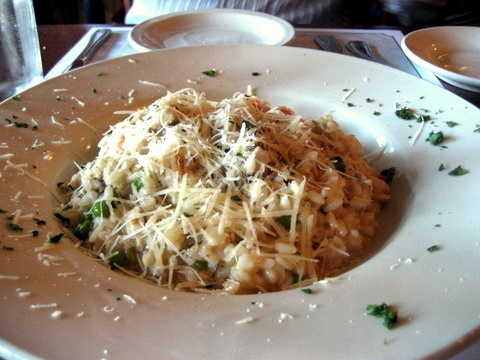 Ever since I had risotto at Studio, I have felt oddly compelled to order it whenever it is available. This was a fairly standard example, rice slightly overcooked, classic seasoning of parmasean and white wine. The use of chicken and simple vegetables reinforced the comfort food feel of the dish. 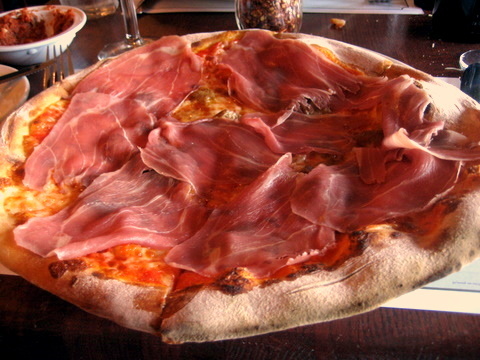 I am normally a fan of mushroom and prosciutto pizza but the prosciutto on this pizza came out with a slight funk. What's worse, the mushrooms tasted as if they came straight from a can, overly salty and almost slightly moldy. So the dough is wonderfully crispy, but I left La Parolaccia with the glaring weaknesses in the Reggiana and Carpaccio on my mind. A decent pie crust is not enough to overcome the lackluster flavor profiles. 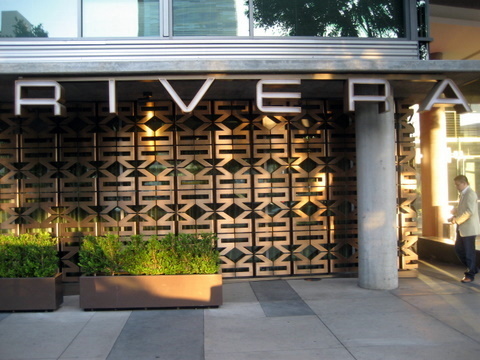 I had heard a lot of great things about Rivera both regarding the new life that Sedlar was bringing to fine Latin dining and the brilliant cocktails of master bartender (don't call him a mixologist) Julian Cox. A twist on the Gordon's Cup, using tequila in place of the traditional gin. 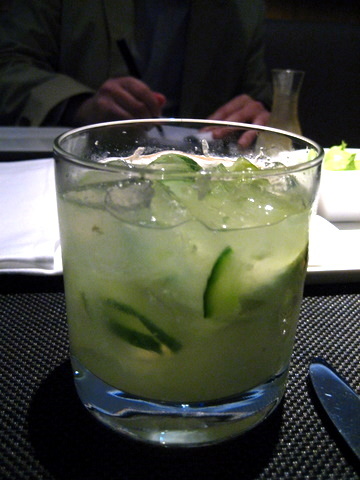 A very well balanced cocktail blending the tang of lime with the freshness of cucumber. 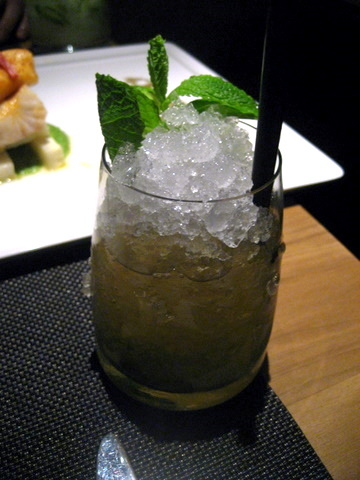 Despite being at a restaurant known for its innovative cocktails, my companion chose to go with a classic instead with the mint and sugar calming the heat of the bourbon quite nicely. 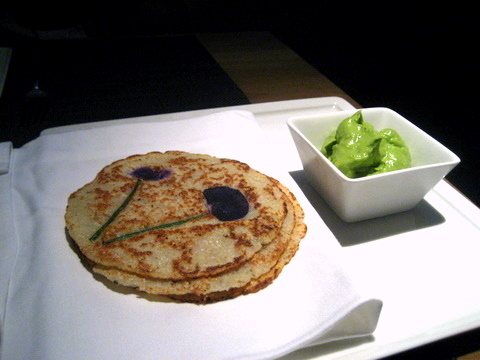 01: tortillas florales - HOUSEMADE NIXTAMAL TORTILLAS, "INDIAN BUTTER"
We started with a serving of fresh warm tortillas pressed with a dried flower and served with "Indian Butter" aka guacamole. The combination is simple but the buttery tortilla serves as the perfect base for the rich salty sweet butter definitely not your average bread course. 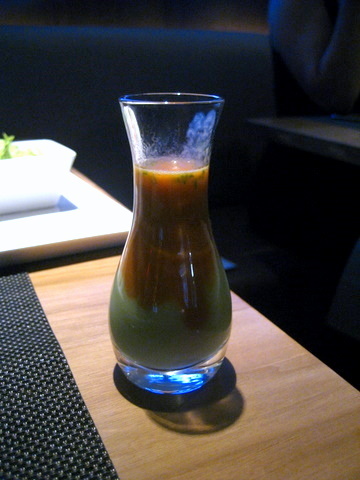 This was a fun little course, basically a shooter of two types of soup which change regularly. For us it was lobster bisque and a fennel apple soup. Immediately apparent is the temperature contrast, first the warmth of the bisque which builds to an almost painful level then the cool soothing relief of the fennel/apple soup. The flavors are almost an afterthought though a delicious lobster/fennel combination is apparent on the finish. 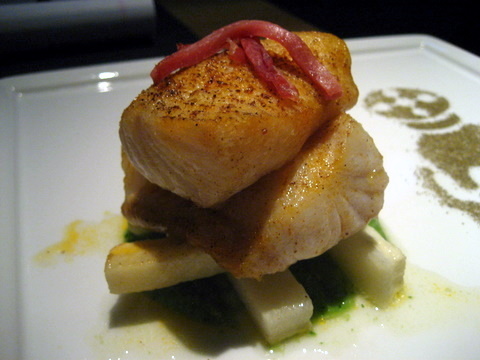 This is one of the few times I've had black cod that wasn't served in a miso glaze. The fish is perfectly cooked exhibiting a flaky supple texture, perfect with the ham crisp which seems to draw out the natural flavor of the cod. The heaviness of the meat is well-balanced by the addition of salsa verde making for a thoroughly enjoyable experience. 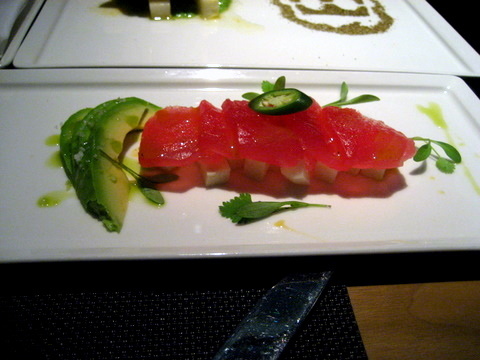 The seviche was served more like a crudo or sashimi, with slices of fish dressed with lime, resting atop a bed of crispy jicama and slices of fresh avocado on the side. Fairly traditional in flavor, I found this dish a bit dull, the fish texture wasn't particularly impressive and the flavors while appropriate were perhaps a bit muted. I had no idea what to expect with this course. What immediately hit me was the smoky flavor of the pepper followed by a tart bitterness. The cheese added a creamy smooth mouthfeel that added a nice textural contrast, though the flavor was completely covered by the pepper. 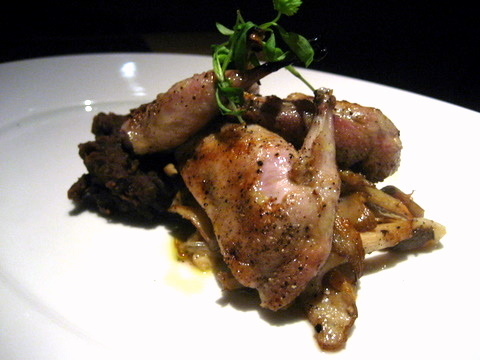 The quail was beautifully cooked with a luscious texture and the natural flavor of the bird immediately apparent. Normally I'd shun any accouterments and solely focus on the bird but the mushrooms were a lovely compliment, earthy with a faint brine, so very satisfying when taken with the quail. 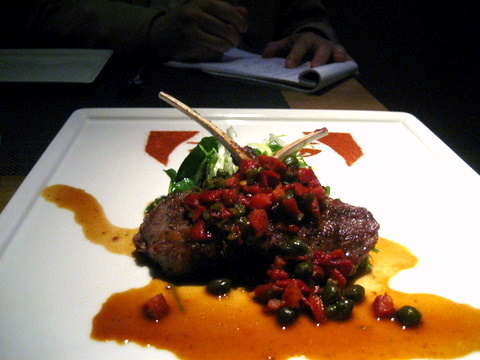 A very well prepared lamb, though I wasn't expecting much from this dish. Expecting the olives and capers would overpower the lamb, I was surprised to find they added a gentle tang to the smoky flavor of the meat. The frisee provided a bitter counterpoint to the heavier taste of the meat making for a well balanced and nicely flavored course. I decided to stick with tequila for my second drink, this time pairing them with strawberries and Falernum which is a syrup of almond, ginger/cloves, and lime. The strawberries made this much sweeter but the Falernum added a bit of spice and bite which kept me from feeling too girly. My companion again opted for a classic cocktail. This was my first experience with Sloe Gin Fizz and it reminded me of a root beer or ginger beer. Quite tasty especially with the thickened egg white to give it some texture. Sous Vide pork shoulder just sounds like a great idea. I was thinking about this course all night and by the time it arrived, I was almost certain it wouldn't live up to the dish in my mind. Turns out the course was even better than I thought, the sous vide preparation trapping the natural juices of the meat rendering it utterly tender and flavorful despite the fairly low fat content. This pork is meant to be enjoyed alone, eat the potatoes sparingly if you must but I beg you at least try sample the pork in its natural state. An extremely dense olive oil cake exhibiting a blunt sweetness. 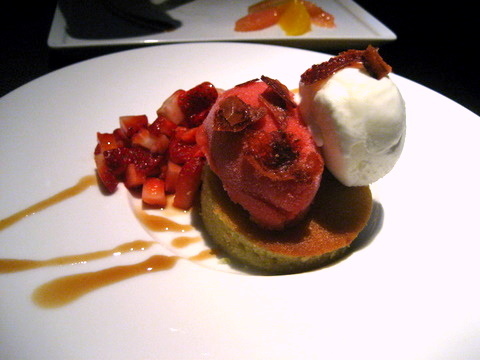 Decently tasty but still a bit simple even with the strawberries and creme fraiche. The standout dessert of the night. The sweet bread came soaked in cachaha and exhibited a nice sweetness that was taken to even dizzier heights when enjoyed with the dulce de leche. The cara cara oranges were a vital addition as they kept the dulce de leche from being too overwhelming. *Light Flan with Blackberry Curry - More like a heavy cream than a flan, this tasted strongly of vanilla and paired nicely wiht the tart blackberry. *Medium Flan with Lime Mint Pepper - A bit firmer and more flavorful than the first, a perfect example of the classic flan. 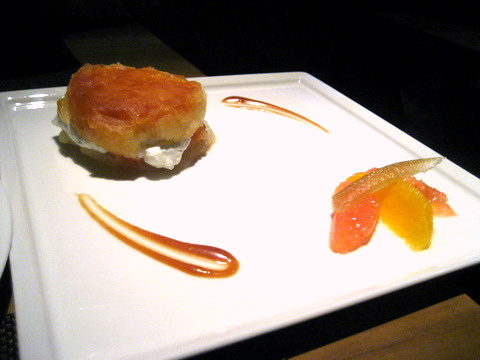 *Heavy Flan with Strawberry Anise Orange - Easily my favorite of the three, quite dense with a strong taste of caramelized sugar somewhat reminiscent of a creme brulee. 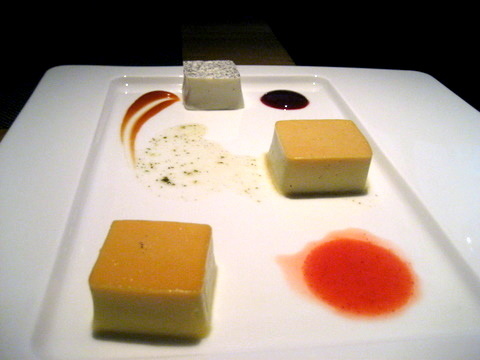 As the flan got heavier, it was better able to stand on its own without the complimentary sauce. An interesting idea though without too much experience with flan I felt some of the subtlety of the light flan was lost on me. Without a doubt Rivera exceeded my expectations. I didn't enjoy every course but that was due to personal preference rather than any lapse by the kitchen. I heard mentions of a new Summer menu and though Summer is almost over rest assured I will be back (cocktail in hand) to taste what Chef Sedlar has in store.